Spears Homes, Inc. has the Largest Selection of New Homes in the Hill Country! *Home Selections: from comfortable low maintenance Garden Homes ideal for retirement living to spacisous homes suitable for families and active adult living. *Choice of Locations: on your property or land lease in adult communities. *Quality & Service: only the best quality home manufacturers are represented, setup and finished by our own personnel with after-purchase satisfaction provided by a full time service department. *Spears Homes Sales of Existing Homes: Click here to view current listings. 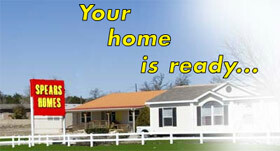 Spears Mobile Homes, Inc. was founded in 1976 by Samuel L. Spears. Mr. Spears and his wife Martha have owned and operated Spears Mobile Homes for over 29 years. Their commitment to provide quality housing is well known throughout our community. Spears carries only the best quality manufactured homes available including Patriot, Karsten, Clayton, Schult, and Centara. They have their own setup personnel and full service department. Spears Homes also assists in arranging financing for your new home. Financing is available through several national lenders. This can include land and home loans. Another real plus for Kernville is Spears Homes adult manufactured home communities. They have several top notch communities, including Windmill Ridge which is partly owned and operated by Sam Spears. Choose the Right Home in the Right Location!